2. Grate the lemons finely. Measure two tablespoons of zest and set aside. 3. Discard the rest of the zest. Juice the lemons and strain. Measure the juice and reduce by half on the stovetop or in the microwave. Set aside. 4. Separate the eggs, placing six yolks in a mixing bowl and five whites in the bowl of an electric mixer. Discard the extra white. 5. Place the milk in a small saucepan. Sift in the flour and sugar and whisk together. Place over a medium flame and whisk continuously till the mixture thickens and begins to bubble. Continue cooking and whisking another minute. 6. Remove from heat. Whisk yolks, then whisk small amounts of the milk mixture into the yolks until all has been incorporated. Scrape the mixture back into the pan, and whisk over the flame 3-4 minutes, till the mixture has thickened noticeably. Remove from the heat and beat in the butter. Be careful to whisk around the edge of the bottom of the pan. Turn the mixture back into the bowl that originally held the yolks. 7. Begin beating the whites on low. Using cold butter, butter 6 individual 8-ounce coffee cups, using your fingers to assure that the cups are evenly coated on the inside. Place a couple of tablespoons of sugar in one cup and rotate the cup above the next cup to insure the inside is completely sugared all the way to the top, as the excess sugar falls into the second cup. 8. Continue to the sixth cup, saving any of the excess sugar. 9. Turn the beater up to medium. As soon as peaks begin to form, add two tablespoons of sugar, being sure to avoid the side of the bowl or the whisk. 10. As soon as soft peaks form, add a pinch of cream of tartar. Continue to beat till peaks are firm, but the whites retain some glossiness. 11. Add about a third of the whites to the soufflé base, and incorporate vigorously. Add half of the remaining whites and fold in gently, then repeat with the last of the whites. 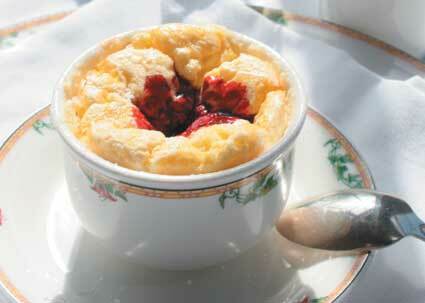 Divide the mixture equally among the six soufflé cups, and gently level the tops. Sprinkle the reserved, reduced juice on top of the soufflés, and bake on a sheet pan till done, about 15 minutes. The tops of the soufflés should be firm and just beginning to brown. Remove the pan of soufflés from the oven, dust with powdered sugar, place on saucers and serve immediately with wild huckleberry sauce. Combine the sugar and water in a small saucepan. Heat slowly, stirring, to dissolve the sugar. Using a vegetable peeler, peel three strips of zest from the lemon and add to the sugar syrup. Bring to a boil and boil five minutes. Remove from the heat and let cool. Transfer to a storage container, cover and refrigerate. Extra syrup can be kept refrigerated for a month. Place the huckleberries and syrup in a saucepan and bring to a simmer. Simmer until the huckleberries are soft, and remove from the heat. Let cool slightly, then puree in a blender. Pass through a chinois, pressing on the berries to extract as much liquid as possible. Add a squeeze of lemon juice. If the sauce is too thin, wipe out the saucepan, return the sauce to the saucepan and reduce slightly. If it is too thick, add some additional sugar syrup. Extra sauce can be kept refrigerated for a month. Warm the sauce before serving. Allow about two ounces of sauce per soufflé.